Gender neutral baby showers can be challenging because the obvious themes and color schemes aren’t good options. For my dear friend Laura, I went with a theme that would honor her love of reading and her mother, who is a librarian in our home town. With a little planning it was easy as ABC. I love creating extra special invitations – it’s such a treat for your guests and we all love the feeling of receiving a delightful surprise in the mail. 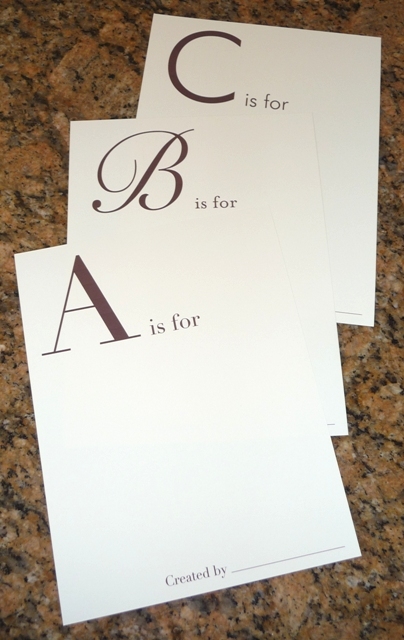 The invitation itself was simple – I added baby blocks at the bottom and printed my own ABC envelope liners (my favorite part). But what made this particularly fun for guests was that it arrived in an 8.5″ x 11″ envelope because also included was a scrapbook page for each guest to complete. Sometimes bigger is better and an oversized baby shower invite?…that’s unexpected. Playing on the alphabet theme we mailed each guest a scrapbook page with one letter (we happened to have just the right number of guests to make this work). With an instruction card we asked them to design a page in the theme of their letter with baby related words, parenting advice or memories of Laura. We left it very open-ended and encouraged them to be creative. There is some risk when doing a project like this, as you never know if your guests will have the time or creative energy required. 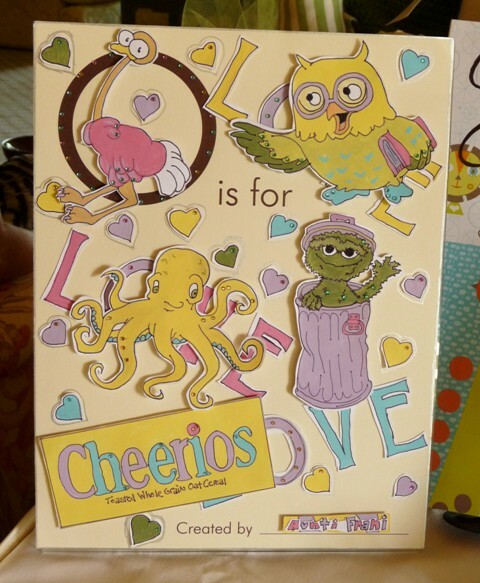 But, I must say, I was SO proud of everyone – the ABC pages were absolutely adorable. 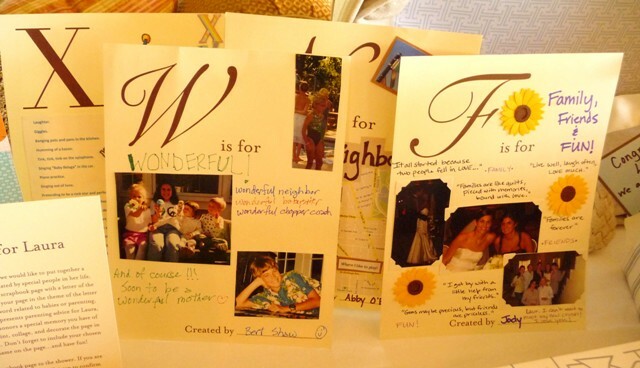 We displayed a few at the shower and they will all be turned into a keepsake book for Laura and the baby. It’s a true collection of thoughtful messages from the important women in Laura’s life. P.S. Stay tuned for another post about the baby shower game we played and how our new Zutter machine brought it all together. Kristen not only is this execution lovely, but the idea is wonderful for both the baby and the mom-to-be – just love it! Totally adopting this for a friends’ shower! I saw this at my friend’s baby shower over the weekend. She said she just got it easily at etsy: https://www.etsy.com/listing/172818572/printable-alphabet-book-pages-makes-a?